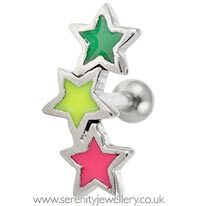 Three neon colour enameled 5mm stars (13mm total height) on a surgical steel 6mm or 8mm bar with 3mm screw-on ball closure secured at the back of the ear. Bought this as a present for my 80's mad friend but keeping it for myself! 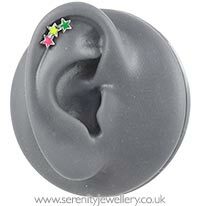 So colourful and fun it'll look great in the summer. Only problem is I've got to buy another one now! 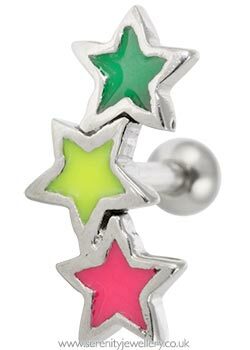 Bought for my daughter, she loves the stud, looks great.